Retrevo publishes annual report on HDTV and March Madness that recommends best LCD TVs and Plasma TVs for watching this years college basketball playoffs. There's still plenty of time to use Retrevo to help select the best value in HDTV , find an HD provider, install a set, and sit back and enjoy the games. It's that time of year again; sixty five men's college basketball teams in four regions around the country begin playing on March 20th. The women's teams start their playoffs on March 23rd. By April 5th it's down to the final four with the championship game played on April 7th. Is this going to be the year that sports fans watch the games in HDTV? Andrew Eisner, director of content at Retrevo says, "There's still plenty of time to use Retrevo to help select the best value in HDTV , find an HD provider, install a set, and sit back and enjoy the games." Who's Broadcasting in High Definition? Starting this year CBS will broadcast all games in the men's tournament in High Definition. If a TV set can receive CBS HDTV over the air or via cable it should be in good shape. For the women's games, fans will have to get ESPN which will be broadcasting many games in HD. 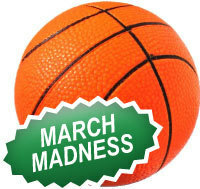 DirecTV offers a 'Mega March Madness' package for $69 but only broadcasts 'select games,' in HD. DirecTV is also not allowed to broadcast games available on local stations and uses the subscriber's zip code to black out those games. Basketball can be very demanding for HDTV. A fast moving foreground (the action on the court) against a complex background (people in the stands) make it is challenging to compress, decompress, and difficult to display without artifacts and blurring. The very latest LCD TV sets that offer features like MEMC (motion estimation, motion compensation), 120 Hz refresh, and fast pixel response can help minimize problems. Sets with these features are just starting to show up and may cost a few dollars more. For a little more money, Retrevo recommends taking a look at the brand new 40 inch Samsung LN-T4081 which is the first LED backlit LCD TV to hit the market and costs around $2500. The Sony BRAVIA KDL-52XBR5 52 inch LCD offers 120 Hz refresh and 1080p and goes for around $3200. The Toshiba 46lX177 offers 120 Hz refresh in a 46 inch LCD TV that gets mostly good reviews and is priced at $2400. Pioneer dominates the Plasma TV market. The Pioneer PDP-5010 is part of their new KURO line that features 1080p resolution, 4 HDMI ports, and anti-glare treatment. The Pioneer PDP-5010 will cost you around $3200 but received high marks from reviewers for great black levels and colors reproduction. Rear Projection TVs still offer some of the best values. They continue to fall behind LCD and Plasma TVs in image quality, viewing angle, and they are much bulkier than flat panel sets. Toshiba sells a 72 inch RPTV that displays 1080p and can be purchased for a very reasonable $2000. Mitsubishi offers a 65 inch RPTV the WD-65731 for well under $2000. Out of the top 10 values on Retrevo.com in LCD TVs, three are Syntax Olevia. They are all 720p/1080i but then again all the games will be in either 1080i from CBS or 720p from ESPN. In fact, pretty much the only reason to get 1080p aside from future-proofing your purchase is to play 1080p Blu-ray DVDs or 1080p games on consoles like the Sony PlayStation 3. Otherwise all programming is currently in 1080i or 720p. The Syntax Olevia 242T is a 42 inch LCD TV that gets very high ratings and good reviews and can be purchased for a little over $700. Syntax has a brand new 1080p version called the 242T FHD that features fast pixel response and motion processing and sells for under $1000. Syntax Olevia recently started selling a 52 inch LCD TV, the 252TFHD with features to handle fast action sports. It's selling for under $2000. Vizio has a 47 inch 1080p LCD TV, the Vizio GV47LFHDTV that you can buy for a little over $1000. The 42 inch version, the Vizio VU42LF, gets better reviews than the 47 inch version and can be purchased for well und $1000. Many consumers will face the decision of what to do with their old analog based TV sets when the digital transitions takes place next year. Many will decide to buy a converter box or replace the set or even both. Retrevo has a report covering everything consumers need to know about the coming analog to digital switch over. Retrevo is a great resource for all gadget and gear needs from manuals to reviews whether it's GPS, Digital Cameras, Camcorders, HDTV, or other popular consumer electronics products.